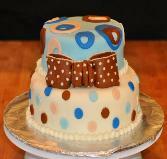 This Baby Shower Cake is perfect for a shower for a baby boy. This amazing cake was made with fondant icing by the Blue Sheep Bake Shop in Metuchen, New Jersey. If you live in this area of NJ you can order your next cake from this bake shop. If you don't you can learn how to make fondant and create your own masterpiece. Click on the picture to see more cakes in Metuchen, New Jersey at the Blue Sheep Cake Shop. If you need a shower cake you will also need some Baby Shower supplies, games and party favors...take a look at some of the cute ideas we have for you. Click on any picture to see more patterns, party games and lots of shower favor ideas. It's so much fun to look at cakes that other bakers and decorators have made. You can get some good, easy ideas from looking at the cakes other people have created. Take something you have seen and add your own twist to it to make a unique and interesting cake design.